In response to the violence in the United States in the past week, the Knights of Columbus are inviting everyone to join in praying a Novena for Peace from July 14-22, using the Peace Prayer of Saint Francis. Let us pray the novena, and invite others to join us! For those in California, especially in the Los Angeles area, the Pauline Center for Media Studies has a couple of excellent upcoming events. This retreat has some marvelous films–if you can go, I highly recommend it! On Monday (July 11), I will begin my eight-day annual retreat, so I will not be blogging for two weeks. However, you will be “with me” on my retreat in a special way–in my prayers! If you send me your intentions, I will pray for them specifically and individually during the retreat. No one has expressed interest in a free copy copy of my book, See Yourself Through God’s Eyes, available in Polish. A story or example from ordinary life that challenges our sense of ourselves. A passage from the Scriptures in which God speaks heart to heart with us and sheds light on the situation, assumptions, or feelings that the previous story might raise in us. Reading and pondering this short line is the key to making the meditation. A reflection that allows the Scripture passage to challenge or speak directly to the false assumptions under which we tend to interpret our daily experience, so that we can grow in our trust in God’s love for us. A short prayer we can repeat often during the day to help us reconnect to God’s love and fidelity. Join us in praying our Novena to Saint Paul, which we are praying in reparation for the misuse of the media. This weekend on my Windows to the Soul segment on the Salt + Light Radio Hour, I talk about three great films with the theme of mercy. Below is a summary of the show and where you can find the complete list of films. Image Journal is a wonderful magazine and online site that looks at the intersection between art and religion. Every year, their Arts & Faith Community publishes a list of great films according to a certain theme. This year, they focused on the theme of mercy: The Arts & Faith Top 25 Films on Mercy. I’ve seen about half of these films which range from 1921-2014, and I’ve been planning to see several more, but a couple of the films on the list are new to me. I now have a wonderful selection of films to see throughout the rest of the Year of Mercy. The top three films are genuine classics from the black and white era, and two of them are in French with English subtitles, but don’t let that prevent you from seeing these wonderful films. 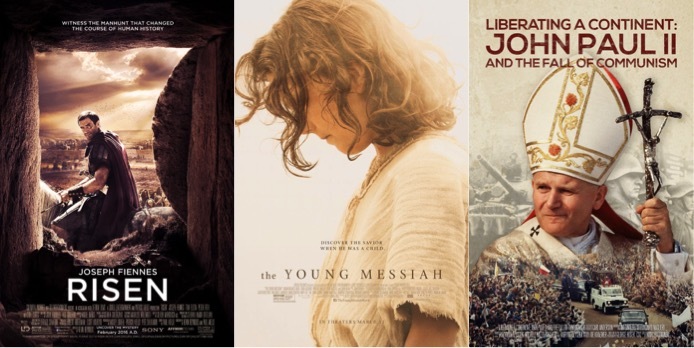 I would especially recommend these films to those who are interested in looking more deeply at the theme of mercy for discussion or prayer, and film lovers. Because of the depth of the films, they may not work for children. Monsieur Vincent is a wonderfully-crafted film that was given a special Academy Award. (I recently gave it honorable mention in my list of best saint movies of all time.) Made in 1947 and directed by Maurice Cloche, the film is a bio-pic of the saint of mercy, Saint Vincent de Paul. 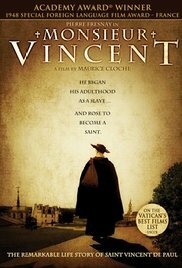 The film doesn’t cover his whole life, but wisely chooses to focus on St. Vincent de Paul as he was beginning his care for people living in destitution, including those suffering from the feared plague and prisoners. St. Vincent de Paul changed society with his great works of mercy in a time where mercy was so greatly lacking. Actor Pierre Fresnay gives a powerful performance of a man who is so taken up with the needs of others that he is fascinating, admirable, and a bit hard to understand because he seems to have no concern for himself. As we watch the film, we could use Saint Vincent’s interactions with the wealthy, the fearful, and the indifferent as an examination of conscience, because the people who resist Vincent’s efforts or refuse to help represent the same reasons why we refuse to be merciful. Amazingly, this film lacks the sentimentality that usually ruins saint movies. Vincent is a shining and compelling figure, as he literally seems to become the love of Christ for the underprivileged. 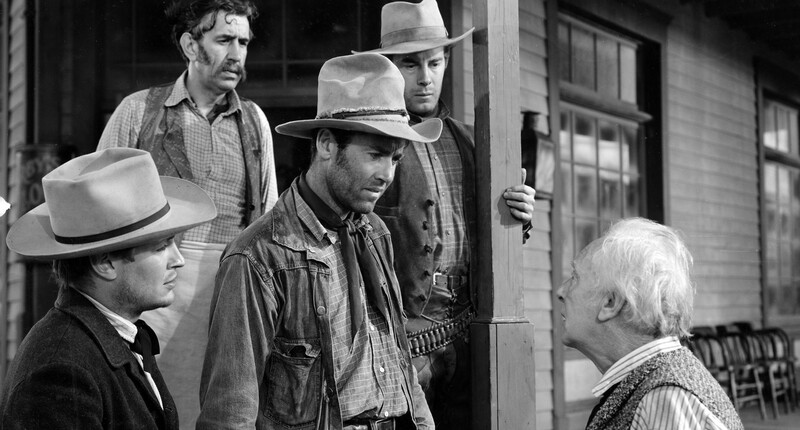 The Ox-Bow Incident is a 1943 American Western, directed by William Wellman and starring Henry Fonda and Dana Andrews. It has been described as a Western film noir, but I found it reminded me more of a gentler version of a Flannery O’Connor novel. The basic storyline is about two cowboys who are passing through a small Western town when the news comes that a well-respected farmer has been murdered and his cattle stolen. The townspeople form a posse to catch—and lynch—the guilty party. The two cowboys join in, partly to divert suspicion from themselves as suspects. The film explores the themes of guilt, justice, innocence, the legal system, conscience, our common humanity. 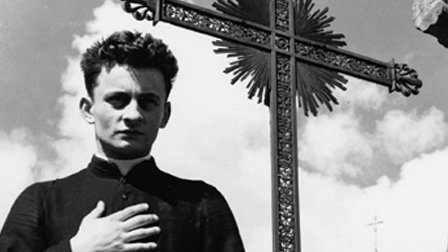 The third movie is the award-winning 1951 Diary of a Country Priest, based on the Georges Bernanos novel with the same name. The screenplay was adapted by the film’s legendary director, Robert Bresson, and is incredibly faithful to the novel. The film stars Claude Laydu in a wonderful performance and is in French with English subtitles. As the title indicates, this is an in-depth look into the daily life of a young, sensitive priest on his first assignment as pastor who, though distressed by the coldness of his parishioners, is willing to make many sacrifices to help them spiritually. The young priest is consistently misunderstood and criticized by all around him, except us privileged viewers who are given access to his daily diary. Laydu’s acting is amazing as a young, idealistic, and holy priest undergoing the dark night of the soul, but all of the characters are well-portrayed. I wish that the character of the priest smiled more in the film. Without giving away any spoilers, this film is about the little moments of life, the daily choices for grace. Don’t watch this movie when you’re in a hurry. Understated, subtle, with deeply layered dialogue, the pacing of the film helps us to slow down so we can enter more deeply into the mindset of the parishioners and especially of this young and holy priest whose sole goal is to bring people closer to peace and happiness in Christ. In a couple places, the film could be studied for the priest’s pastoral approach: when to speak, when to be silent, always to speak the truth, to invite others towards Christ rather than threaten, but to be honest about the consequences of bad choices, and above all, to accompany every pastoral effort with prayer. Risen—the story of a soldier’s journey to faith, released to DVD recently. The Young Messiah, which was just released to DVD, is the fictional story of Jesus’ childhood the year that the Holy Family returns from Egypt. Liberating a Continent: John Paul II and the Fall of Communism is a documentary currently broadcasting on PBS (see list of broadcasts here), will be broadcasting on Salt + Light TV as well, and is already available for purchase online. This documentary is a beautiful tracing of God’s mercy at work in the world through St. John Paul, and behind the Iron Curtain. Even though my blog has had new posts, I’ve a secret. The truth is that for the past two weeks I haven’t been online much. I wrote those entries before I left on my trip to Rome and scheduled them to post. So I was deeply touched this morning, after my return, to discover how many of you are happy that I’m returning to weekly blogging, “liking” my posts and sharing them. A huge thank you! One of the chapels at the Generalate of the Daughters of St. Paul, at the “Casa San Paolo” where we had our meetings. I prayed for you there especially upon my arrival and on World Communications Day on May 8th. At Saint Peter’s, I carried all of you in my heart through the holy door for the Jubilee of Mercy. At the Basilica of Saint Paul Outside-the-Walls, I prayed for you at Mass and then at the tomb of St. Paul. I feel I received many graces. Praying at the tomb of St. Paul the Apostle. I was blessed to be able to visit Saint Paul’s Basilica twice, participate at Mass there twice, and pray at St. Paul’s tomb several times. (My second visit was a half-day mini-retreat.) I suspect a few people thought I was crazy to make a retreat at Saint Paul’s Basilica when there is so much to see in Rome, and I still hadn’t done half of the things I’d like to do there, but it’s such a special place for me. I found out recently how often our Founder, Blessed James Alberione, used to go and pray there—especially when he was starting the film apostolate—and so it’s grown even more meaningful for me to pray there. Unknown to me, he and I prayed for the film apostolate in the same place, some 65-75 years apart! My trip to Rome was a beautiful opportunity to deepen my understanding and living of the apostolic mysticism of our Pauline spirituality. It was also a wonderful opportunity to reunite and meet with many Daughters of Saint Paul who are communicating Christ in various ways throughout the world. I feel like I am overflowing with good news to share about my own journey of faith…and I’ll be blogging about that! I wanted to add to my earlier blogpost about traveling as a writer, with pilgrim eyes of faith. Another advantage of traveling as a writer is the way the lack of familiarity puts you in touch with living in the present moment. When we are away from home—and especially if we are visiting outside of our country—we realize how very much of our lives is out of our control, and how much we depend on God and others for our daily needs. I found that when I placed my trust in God for the things that I would normally take for granted (for example, finding food that fit within my restricted diet), I received so much more than what I needed! God blessed my little acts of faith with abundance. This kind of entrusting ourselves to God’s care (usually received through others’ goodness) is an essential aspect of pilgrimage, and it also creates space in us to receive. Being more receptive to the unexpected is, of course, a wonderful way for writers in particular to relate to the world around them, as it compels us to live fully in the present moment, attentive to the “fingerprints” of God in our day. The pilgrimage journey of faith opens us up as writers to notice and live within the action of God. While I was on the last days of my journey of faith this week in Rome, the film Risen, which is a cinematic journey of faith, released digitally. You may have read my review of Risen when it was released in the theaters, where I talk about the film as an excellent “launching pad” for prayer, reflection, and dialogue about faith and what it means in our lives. Risen is now available digitally on iTunes, Amazon digital download, and several other places. (The full list of available sites to stream or download a digital copy is here.) In two weeks, Risen will release to DVD, and as a way to help people become more aware of the film, I’m participating in a Risen blog tour, as well as a special DVD giveaway, courtesy of Sony. (I’ll post the details soon—check back!) For the film’s release, I will make available a reflection/prayer guide for the film that you can download and use personally or with a group. In addition to making the 7 Qualities of Mercy online mini-retreat for Lent, I have decided to focus my Lent around listening. Pope Francis’s Message for the 50th World Communications Day is what inspired me to choose to focus on listening. Listening is a wonderful quality that is a prerequisite for genuine communication—with God first of all, but also with self and with others. Silence and word: two aspects of communication which need to be kept in balance, to alternate and to be integrated with one another if authentic dialogue and deep closeness between people are to be achieved. When word and silence become mutually exclusive, communication breaks down, either because it gives rise to confusion or because, on the contrary, it creates an atmosphere of coldness; when they complement one another, however, communication acquires value and meaning. Word and silence: learning to communicate is learning to listen and contemplate as well as speak. Communicating means sharing, and sharing demands listening and acceptance. Listening is much more than simply hearing. Hearing is about receiving information, while listening is about communication, and calls for closeness. Listening allows us to get things right, and not simply to be passive onlookers, users or consumers. Listening also means being able to share questions and doubts, to journey side by side, to banish all claims to absolute power and to put our abilities and gifts at the service of the common good. As communicators, we seek to imitate Jesus’ self-emptying or kenosis in our communication. In God’s desire to be close to us, in order to redeem us and heal our broken relationship with God, Jesus emptied himself, taking on our human nature, and giving himself up to a horrific passion and death. Jesus is the full expression of the merciful love of the Father. In every aspect of his person, his life, and his death, Jesus seeks to draw us closer into the embrace of the Trinity. Pope Francis talks about listening as a form of self-emptying love, similar in a way to Jesus’ kenosis. Listening can be a sort of martyrdom. In truly listening, we imitate Jesus’ self-giving, sacrificial love, by putting ourselves and our agendas aside and becoming deeply receptive to whomever we are listening to. Deep listening enables us to become aware of the sacredness of the other. Even if we are just having an ordinary, everyday conversation, deep listening takes us beyond the surface to glimpse the depth of someone else’s humanity and thus, how beloved they are by God. Lent is a time to die to ourselves so that we can rise with Christ. Learning to listen better is a concrete way to die to self and to welcome the other in a genuine encounter of love and mercy. When we really hear and understand one another, we are more likely to respond with compassion, gentleness, and mercy. In closing his message, Pope Benedict entrusts the work of evangelization through the media to Mary, “whose silence listens to the Word and causes it to blossom.” May our silence and communication this Lent also blossom into expressions of God’s Mercy. Join me in making the 7 Qualities of Mercy online mini-retreat for Lent! The Conversion of Saint Paul is always a special feast day for me, but this year it has special poignancy because Pope Francis’ Message for World Communications Day this year seems to me to be a personal and community invitation to “convert” our communication. For some time, I’ve known what this message confirms for me: I’m a great “hear-er,” but not so great of a listener—which is essential to any communication. Below I’ve posted my prayer for a much-needed conversion in how I communicate—both interpersonally and digitally—based on the Message. It can be used as a prayer or as an examination of conscience. While I will use it today during my Hour of Adoration, I’m planning to re-visit it during future retreats. I think there is something for every communicator to reflect on in his message, which encourages us to speak the truth in love, with merciful love. Jesus, living Image of the Father of Mercies, help me to make mercy the distinctive trait of all I am and do, so that my every word and gesture expresses God’s compassion, tenderness, and forgiveness for all. Father of Mercies, You placed us all on this earth to journey towards the fullness of life in Christ. As a communicator, our primary task is to communicate the truth with love. Bless our every act of communication so that, by selecting our words and gestures with care, we can build bridges, enable encounter and inclusion, and enrich society. Teach us in our communication to avoid misunderstanding and to contribute to healing wounded memories and building peace and harmony. May mercy so shade our thoughts and speech that the truth we speak, leads us away from judgment, separation, exclusion, or competition, instead leading all towards conversion, freedom, respect, and unity. Lord, above all we pray for the gift to listen—a unique form of martyrdom where we renounce closed-mindedness and defensiveness, removing our sandals to stand on the “holy ground” of encounter with the one who is speaking to us. Teach us how to listen, a listening that means acceptance, true understanding, and paying attention: sharing questions and doubts, journeying side by side, and banishing all claims to absolute power and superiority. Lord, touch all communication with Your own power. We pray in a special way for those who lead and those who form the opinions of others, that they may speak the truth to uplift the oppressed and guide troubled peoples toward reconciliation. We pray that they will have the courage avoid the temptation to exploit differences, stirring up mistrust, fear, and hatred. We pray for harmony in our world, that the vicious circles of condemnation and vengeance can be transformed into circles of dialogue, openness, freedom, and respect, so that our human family may be healed and draw closer to each other as true brothers and sisters. Amen.